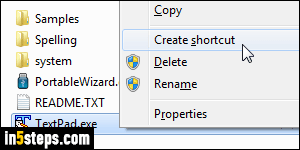 When you right-click on a file in Windows 7/8/10, one of the context menu's options is the "Send to" submenu, which lets you open file with a particular program (just like the "Open with" submenu), or create a copy or shortcut of the selected file(s) into the destination folder. 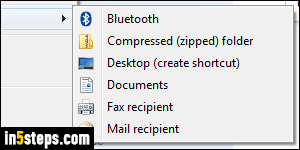 This screenshot shows the default Send-to items in Windows 7: Bluetooth, Compressed (zip) folder, Desktop (create shortcut), Documents, Fax recipient, and Mail recipient. 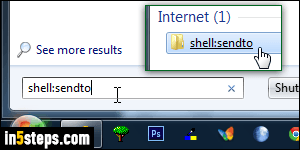 Just type "shell:sendto" in the start menu and hit Enter to open it. To customize your Send-to menu, drag-and-drop a shortcut to a folder you want to add to the Send-to folder itself. Tip for all versions of Windows: when you drag-and-drop a file or folder while holding down the Alt key the whole time, releasing the mouse button will create a shortcut. In recent versions, Windows will say "Create link in SendTo" in the flying tooltip as confirmation. Changes you make to the Send-to menu only affect your Windows user account. To add an application, just follow the same steps: find the program in your Program Files folders, right-click on it, and choose "Create shortcut". Because this is a protected / system folder, you'll get a "Windows can't create a shortcut here. Do you want the shortcut to be placed on the desktop instead?" 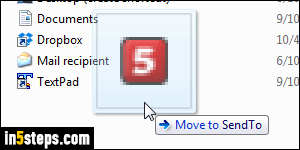 Click Yes and move the program shortcut from your desktop to the Send-to folder. You can also delete shortcuts you don't want to appear in the send-to menu, or create folders to hide the ones you don't want to see, but would like to keep. I created an "Original content" subfolder for the original shortcuts. 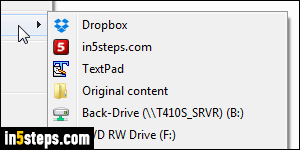 Notice that Windows automatically adds your hard drives, external drives, and network / shared drives in the menu. Close the Send-to folder when you are done.